Situated at the heart of the School, the Library combines the Victorian beauty of the former main School with up-to-date technology, computers and modern study desks. he Library aims to provide a peaceful place for pupils and staff to work. It offers a stimulating research base, encourages independent learning and makes reading a positive alternative to more frenetic free-time activities. Upon completion of the Quad Development, the Library will move from its present home to sit at the heart of the new buildings. In addition to the book-lined recesses of the new Reading Room, the new Library will offer the latest technology to pupils, enabling the best in collaborative study techniques and encouraging the pupils to work and learn together. Find out more about the Quad Development project here. The current Library is home to over 8,500 non-fiction books, providing research material in all academic subjects. All of the books are available to loan for pupils at all times, whilst 26 magazines, covering a wide range of interests are also provided, as is access to a range of magazine and newspaper archives as well various databases and websites for academic research. The link with the public library service also means that pupils have access to more than 940,000 additional titles. The Library provides a dedicated foreign language fiction section, allowing pupils to choose from and develop their skills in French, Spanish or German. There is also a fairly substantial graphic novel section available, housing a variety of genres and artistic styles. There are 100 work spaces which include 23 computer work stations. The Library has wireless hubs and pupils are encouraged to come in with their laptops. The Shells all take part in the Reading Challenge in their first two terms, whilst the Fourth Form receive an introduction to research and referencing skills from the Head Librarian and the TPE Department, which is also provided as ongoing advice to the Sixth Form. The Library provides a reading list for Fifth Form and Sixth Form pupils with all of the books listed available to borrow from the library. These recommendations are broken down by related academic subjects. You can view the list here. Pupils are encouraged to engage actively with their own learning experience at St Edward’s. 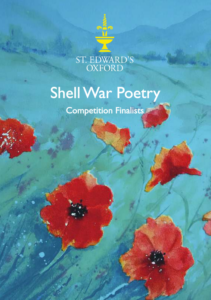 During their English lessons, Shell pupils looked at the literature from the First World War to mark the centenary of the armistice in November 2018, with a particular emphasis on the contemporary poetry. They were given the opportunity to deepen their understanding by entering a competition and writing their own First World War poetry. More than 40 pupils chose to enter and you can read the shortlisted fourteen entries in the booklet here. 8.30am to 9.00pm Monday to Friday, 8.30am to 6.00pm on Saturdays, and 10.30am to 6.00pm on Sundays.